At Arlington Pediatric Dentistry, we believe every child deserves to grow up with a healthy, beautiful smile. That's why our doctors and highly trained team of orthodontic specialists work hard to treat every patient on a holistic, individualized basis, designing personalized treatment plans that perfectly suit each patient's unique dental needs and development. But for us, treatment should always be a last resort: the best way to achieve a great smile is through prevention. Tooth decay is often referred to as the second most common disease in the world - bested only by the common cold! If left untreated, tooth decay can cause pain, discomfort, tooth loss, and sometimes even gum or bone damage - but thankfully, it's easy to treat and even easier to prevent. Even so, it's still one of the most common conditions in medicine, affecting a quarter of 2 to 5-year-olds in the US and up to half of 12 to 15-year-olds. Before we can learn to prevent tooth decay, though, we have to understand it - and it all starts with bacteria. Thousands of strains of bacteria live naturally inside your mouth, some good and some bad. Unfortunately, when acids, sugars, and tiny food particles stay trapped inside your mouth, bacteria feed on these particles and secrete acids that corrode and eat away at the enamel of your teeth. 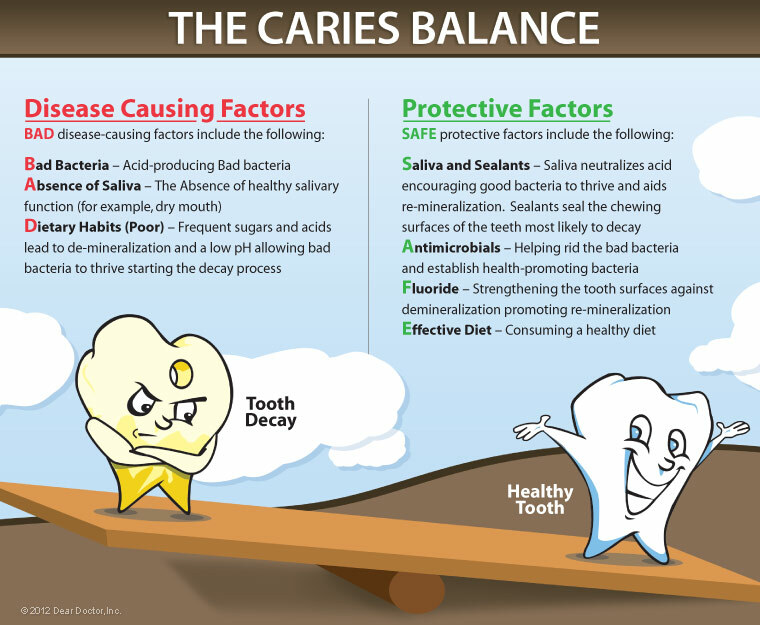 Preventing tooth decay is about controlling those bacteria and minimizing the presence of acids, helping to safeguard the health of tooth enamel. While preventing tooth decay isn't difficult, there is no one "magic bullet" that can stop cavities. 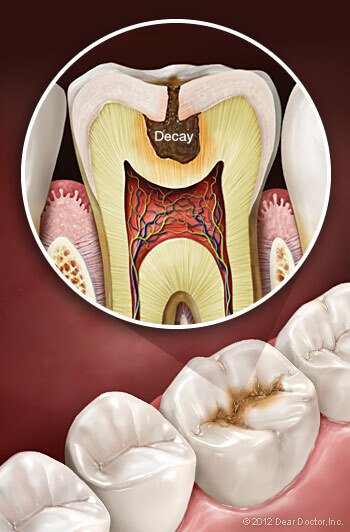 Battling tooth decay is a holistic process involving a number of steps, techniques, and habits. With careful, conscientious care and management, you can prevent tooth decay and cavities, helping your teeth stay healthy and strong for your entire life. 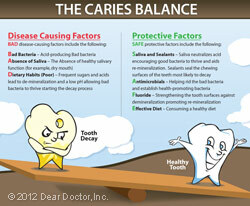 Brushing & Flossing: This is the single, most fundamentally important part of preventing decay. A consistent regimen of daily brushing and flossing is the cornerstone of good oral hygiene, and it's critical to maintaining dental health. Regular Professional Cleanings: In addition to your own daily maintenance, you'll need regular care from a dental professional - and that's where we come in. You should plan to come in for a cleaning at least twice every year, and we may recommend additional procedures or cleanings based on your situation. Watch Your Diet: Diet is important for a healthy body, but did you know it affects your teeth as well? Avoiding foods that are highly acidic or packed with sugar will help prevent bacteria from harming your teeth. Instead, opt for a healthy, balanced diet filled with vegetables and low fat cheeses and yogurt. Even with these steps, though, there's still more you can do. Depending on your situation and dental health, we may recommend special in-office or take-home fluoride treatments, which can bolster the health of your enamel against acids and other damaging chemicals. 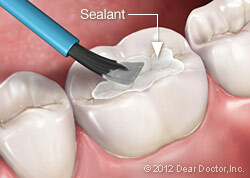 Another possibility, particularly for children, is dental sealants. The number one source of cavities for school-aged children in the US is in the chewing surfaces of the back molars: filled with nooks and crannies where food can hide, they're almost impossible to keep clean. Treatment with dental sealants involves coating those areas with a thin layer of protective resin, sealing off the enamel and preventing damage from acids. We'll talk with you to see if this would be an effective step for you or your child. Preventing tooth decay is a lifelong, daily process, but it's well worth the effort – a healthy smile boosts every area of your life. To learn more about tooth decay prevention or find out how you can help your child develop a healthy smile, check out our patient education resources. If you have any questions or would like to set up an appointment, feel free to call us at 703-671-KIDS, reach out to us at our contact page, or request an appointment online at our Arlington, VA office.